You don’t need a fancy curling iron to get beautiful, bouncy curls! Follow these steps to turn your flat iron into a curling machine. Section off your hair. It will be easier to curl your hair in smaller sections. A good rule of thumb is to use sections 1 to 2 inches at a time. Sectioning your hair will also reduce the chance of missing any pieces of hair. Apply heat protectant. Spray each section with heat protectant before you begin curling your hair. Heat protectant will create a barrier between the hair and iron. Using a heat protectant not only protects your hair, but many protectants also reduce frizz. Use a thin flat iron. Your flat iron should be 1 to 2 inches wide. It’s very important that your iron has rounded edges. If the edges are flat, it will be difficult to pull through your hair and will not create a curl. Using your iron, feed a 1-inch section of hair through your iron – starting close to the neck. Next, in one even motion (or else you will create creases in the hair), twist your wrist away from your face, so the hair flows over the iron. 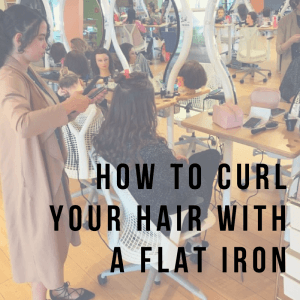 As you pull the hair through, you want to make sure your section continues to wrap around the iron’s plates as you pull towards the ends of the hair. Continue feeding 1-inch sections through your flat iron until you have a lovely full head of curls! Once your curls have cooled, run your fingers through the curls to break them up a bit. Give your hair a spritz of hairspray and you’re ready to go!